I love pizza. It’s versatile, delicious, kid-friendly, vegetarian-friendly, meat-friendly, everyone-friendly. Also, a lot of my love for it has to do with the fact that no two pizzas have to be the same – ever! Toppings and sauce choices make pizzas SO fun and SO delicious. For example, who ever said that if you have two people at home who have different tastes, you can’t make half a pizza with one set of toppings, and the other half with another set? 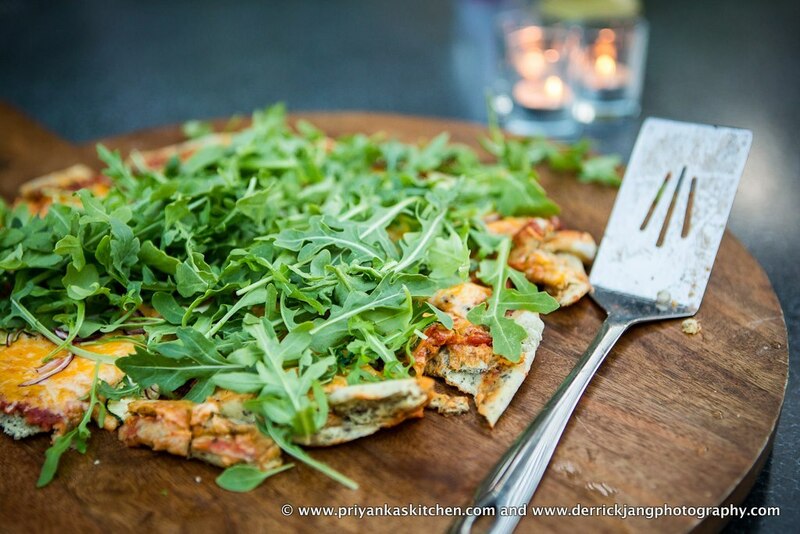 (see picture below from a fun pizza night at my place – I’m the mozzarella lover, hubs like everything else ;-)). 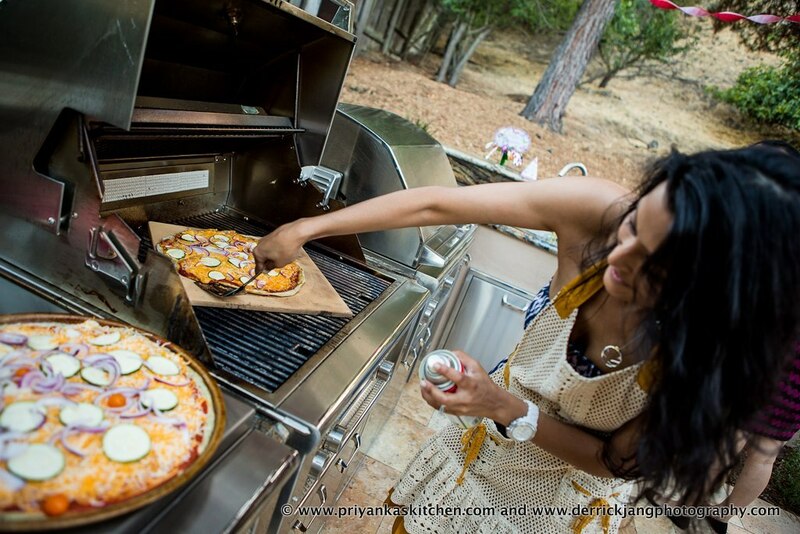 If you’re a meat lover or vegetarian alike, you will LOVE my grilled pizza recipe. Not only is the crispy texture of the pizza dough heavenly, but this recipe uses store-bought pizza dough which makes everyone much much happier!! 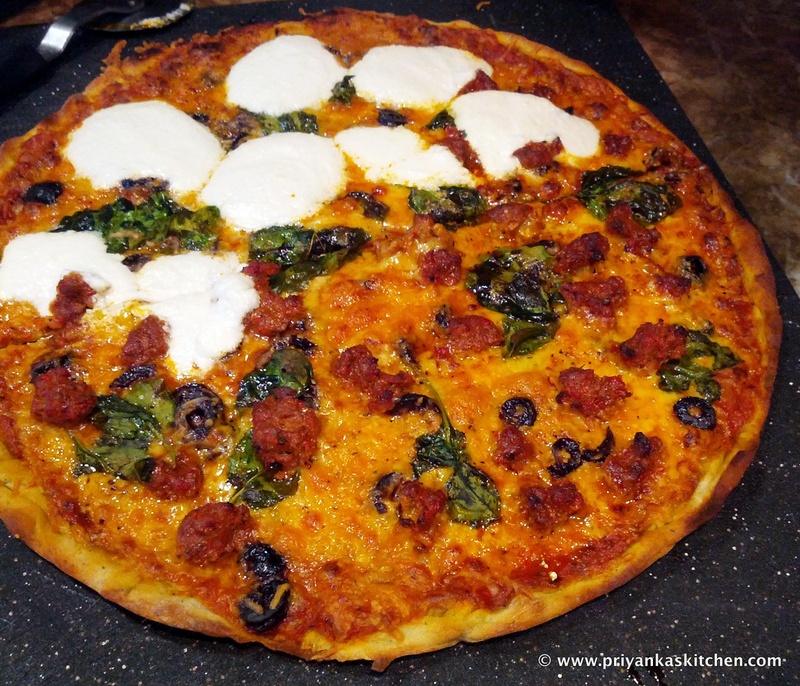 Don’t get me wrong – homemade pizza dough is AMAZING, however it does take practice and it does take some time. Why fret all of that (especially on a weeknight) when both Trader Joe’s and Whole Foods sell 1 lb bags of pizza dough (in the refrigerating sections!) ranging from whole wheat, garlic herb, regular plain pizza dough, and whole grain? And just when you thought it didn’t get better, they sell them for around $1.29 a pop. Yields: 1 beautifully thin and crispy grilled pizza! On a lightly floured surface using a rolling pin, roll out your dough as much as you can to the thickness you enjoy (I like mine thin!). Just be careful not to rip holes in the dough. Coat your pizza tray with cooking spray and lay out the rolled dough on it, using the edges of your fingers to expand the dough to fit the pan properly. Push along the edge of the pan/dough and pat it down gently. Using a fork, gently prick the dough throughout to prevent the pizza from having large air bubbles (which makes spreading sauce on it very difficult!). Brush the extra virgin olive oil onto the dough and sprinkle salt on top, evenly. Place pan directly onto heated grill and let it heat up for 3-4 minutes. Remove from grill and top the pizza with sauce of your choice, cheese, and toppings of your choice. UPDATE: 2/12/12: See one of my readers’ review on this recipe here! Hey all! This is a simple recipe that I made the other day for a lunch and this was a HUGE hit! Change things up by baking this in a square pan instead of a round one – cut square pieces and enjoy as finger food or with a salad to complete a light meal! 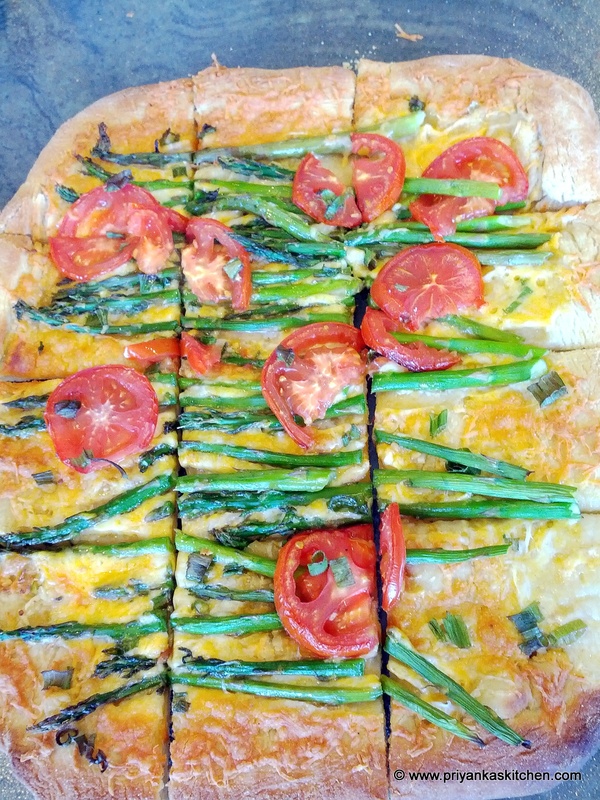 The fresh asparagus and tomato slices gives you a burst of fresh flavor and skipping the tomato sauce makes this dish a lot lighter than your regular, every-day pizza. Hope you enjoy this recipe :). Prepare your rolling surface for the dough by sprinkling 1/2 of your all-purpose flour on the flat surface (this prevents your pizza dough from sticking). Using a rolling pin, roll out your pizza dough on your floured surface. Roll it so that you end up with a crispy, Italian-style pizza (if you prefer to roll it thicker, increase your baking time so that you don’t end up with raw pizza dough!). Spray your pizza pan with cooking spray and pick up the rolled pizza dough from your surface and move it to the greased pan. Don’t worry if your pizza dough looks too small for the pan at this point, or is an odd shape! The great thing about pizza dough is that it stretches! Now stretch the dough to fit the pizza pan (your pan can be circular or rectangular, your choice!). Using two fingers (index and middle), work around the edge of the pizza pan and dough and compact the edges so they sit perfectly on the edge of the pan (your dough should not be spilling over the sides of the pan, but rather contained on the pan). Drizzle the olive oil on the pizza dough and spread evenly. Sprinkle on the kosher salt. Now bake the pizza in your preheated oven for 3-5 minutes (depends on your oven strength). This allows the crust to cook a little for extra crispiness in your end product. 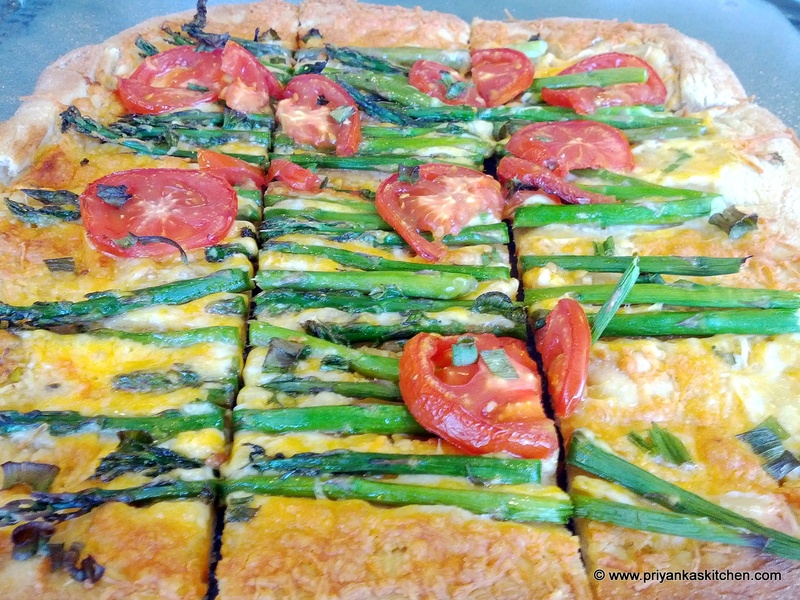 Now add the cheese, asparagus, tomato slices & green onion. Bake for an additional 3-5 minutes until the cheese is melted and the bottom of the pizza is done to your desired crispiness. VARIATIONS ON THIS RECIPE: Use a pesto sauce or Alfredo sauce if you don’t like your pizza sans-sauce. Or try adding roasted corn AFTER you have pulled the pizza out of the oven before serving. YUMMO!!! I am so excited to share this recipe with all of you because a) it can be adjusted very easily to become ‘vegetarian’, minus the egg and bacon part and b) when I made this recently and posted photos on facebook, many of you got so excited about this recipe! The great thing about this recipe is that it’s a flexible one – I suppose all pizza recipes can be adjusted to your liking because the only constant is the flour you are using to prevent the dough from sticking (yes, even the dough-type can be changed! options range from herbed dough, wheat dough, parmesan dough, you name it!) You can even use more cheese or less (I like my pizzas super cheesy!). If you are a vegetarian (or just don’t like eggs in this style for whatever reason), just omit them (and the bacon)! If you LOVE mushrooms, add them! Some other toppings that I love on this pizza that are not included in this recipe are: prosciutto (can be baked or added at the very end), baby spinach, different kinds of cheeses (colby jack, shavings of grana padano after it’s baked, sun dried tomatoes, artichoke hearts, and olives). Drizzle the olive oil on the pizza dough – it doesn’t need to be on every inch, but spread out evenly as a drizzle. Sprinkle on the kosher salt. Spread the tomato sauce right until the edges. If you prefer a larger crust, leave more room on the edge without sauce. Now add all the cheese, and top with all of the toppings except the eggs! 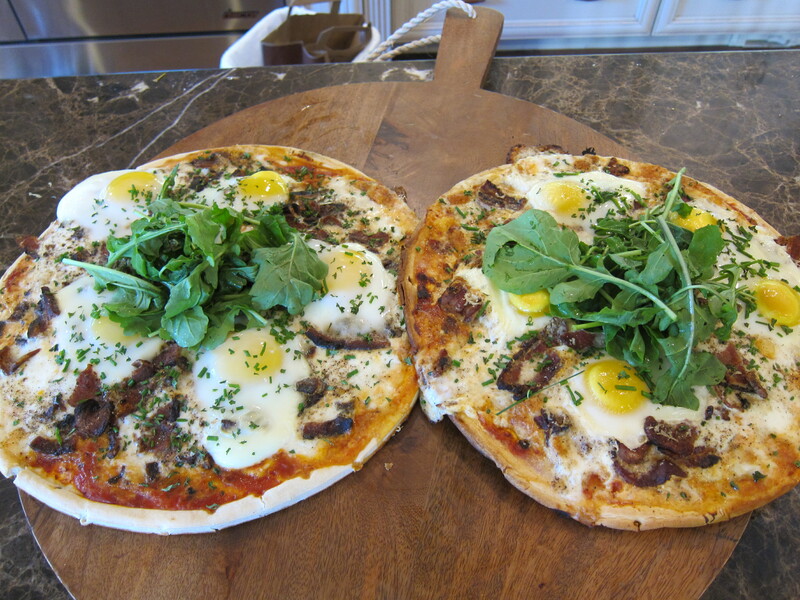 When you are ready to add the eggs, create four ’round spaces’ or ‘wells’ in the cheese with your fingers as little landing pads for the eggs you will crack onto the pizza (don’t dig into the dough, this is only to make sure the egg white doesn’t ooze all over the pizza and remains contained). You can space these out however you want on the pizza. Crack away! Now bake the pizza in your preheated oven for 7-9 minutes (depends on your oven strength), rotating the pizza pan once halfway through. Your eggs should be cooked the way you like them (I like mine slightly runny, but you may prefer yours well done!). Now add freshly ground black pepper, fresh arugula, chopped chives, fresh chopped parsley, and any other toppings you would want on your fabulous breakfast pizza. VARIATIONS ON THIS RECIPE: Use a pesto sauce or alfredo sauce instead of marinara for a fabulous new taste!